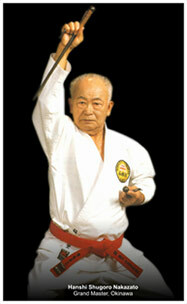 Hanshi Shugoro Nakazato is one of the most influential living karate Grand Masters in the world. 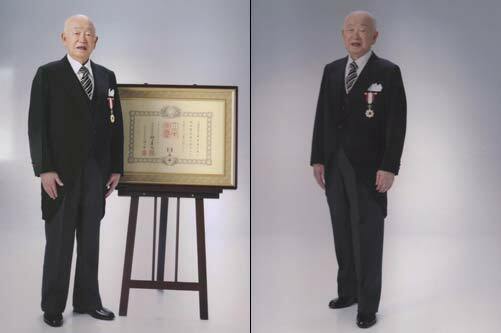 He is the Grand Master of Shorin Ryu Shorin Kan Karate- Do. Dojo until January 10, 1954,when Nakazato received his Shihan Menkyojo and became Master Chibana's Shihan Dai (Main Assistant).  After working as the Shihan Dai in the Matsuo Dojo under Chibana's direction for one and a half years, Nakazato was commissioned by Chibana to found the Shorin-Ryu Shorin Kan Nakazato Dojo in Naha city at Aza. Nakazato was appointed as one of the directors of the Okinawan Karate Federation when it was formed in 1956, associating the four major (shiryuha) systems of karate in Okinawa (Goju-Ryu, Ueichi-Ryu, Shorin-Ryu (Ko), and Shorin-Ryu (Matsu). During this time, Nakazato sensei devoted all of his time and energy to teaching and perfecting Shorin-Ryu karate. In 1960, the Okinawan Karate Federation promoted him to Eighth Degree Black Belt and titled him "Kyoshi." Seven years later, Nakazato sensei continued his progress in karate when Master Chibana and the Okinawan Shorin-Ryu Karate Do Kyokai promoted him to Ninth Degree Black Belt and bestowed the title "Hanshi" on him. Master Nakazato began his study of weapons almost from the beginning of his training in 1935. He was trained in the sai, bo, nunchaku, tonfa, and nicho kama, but specialized in bojutsu for four years. Throughout his career, he has given of his knowledge willingly. He has demonstrated his technique of karate all over the world and has made many trips to America in the furtherance of Karate Do. When Master Chibana passed away in February, 1969, Shugoro Nakazato inherited the leadership of Okinawan Shorin Ryu Karate Do, thus becoming a Tenth Degree Black Belt. Nakazato sensei headed the Okinawan karate delegation and was asked to give a special performance at the 1996 Olympic Games held in Atlanta, Georgia. In May 1999, he led an Okinawan seminar delegation of Grand Masters to the United States promoting The 1st Okinawa Traditional Karatedo & Kobudo World Tournament. 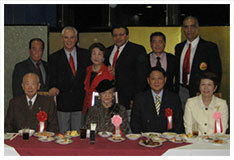 In addition, Hanshi JuDan NAKAZATO is credited for the introduction of the Gorin kata. In August 2000, the Okinawan Prefecture Board of Education bestowed upon Hanshi NAKAZATO the title of "Kenmukei Bunkazi" - Intangible Cultural Asset. 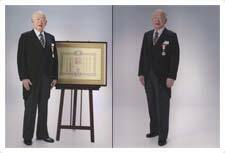 In addition, on November 4, 2007, the Japanese Prime Minister under the hand of the Emperor of Japan awarded Nakazato Sensei the "Order of the Rising Sun with Gold and Silver Rays" - Asahi Soukou sho. This was one of the great achievements for the legendry master. 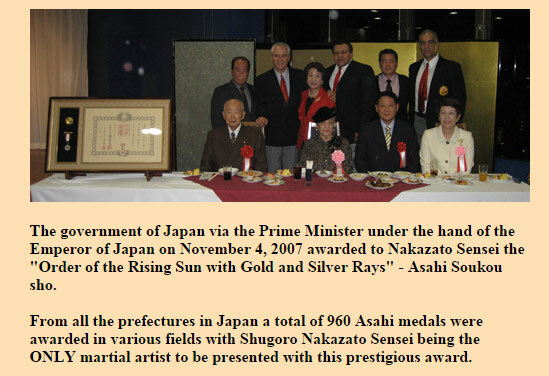 From all the prefectures in Japan a total of 960 Asahi medals were awarded in various fields with Shugoro Nakazato Sensei being the ONLY martial artist to be presented with this prestigious award. Silver Rays" - Asahi Soukou sho.